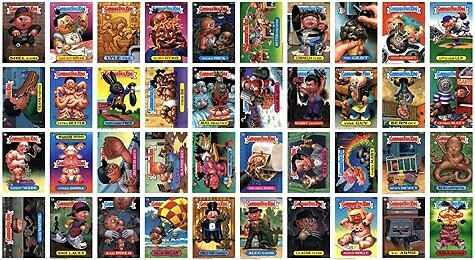 It is possible to make a United States Garbage Pail Kids 15th Series complete variation set with die-cuts and a complete variation set without die-cuts. A die-cut is the part of the card that is impression-punched, so you can pull out the center portion of the sticker. The images above show card 592b Flabby Abby with die-cuts and card 592b Flabby Abby without die-cuts. 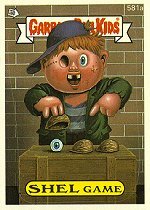 The cards without die-cuts seem to be much easier to obtain, and that is why they have a slightly lower value than the cards with die-cuts. The cards manufactured without die-cuts are error cards, but I decided to include them with the variations because they are common. 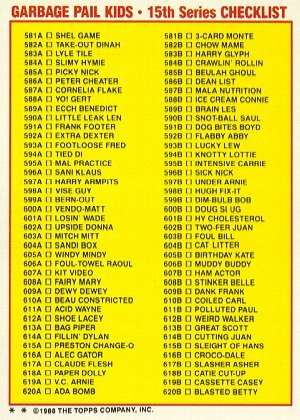 A few collectors had reported finding non-die-cut 586b Dean List cards with a black, eyelash-shaped mark near the left of the name oval. It is not know how common this error is and if it can be found for both the die-cut and non-die cut versions. A card dealer had noted finding a small amount of non-die-cut 594a Tied Di cards with a horizontal black line on the card border directly above the card number. The line is slightly longer than the card number. This does not appear to be a very common error. 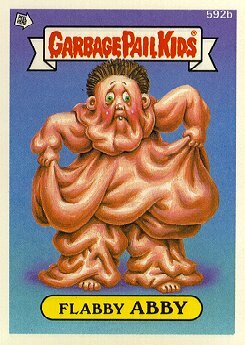 It is not known if the error can also be found in the die-cut version of the card. Card 620b Blasted Betty was printed with a black, eyelash-shaped mark near the card number. The card can be found printed correctly and be found printed with the eyelash error for both the die-cut and non-die-cut versions. 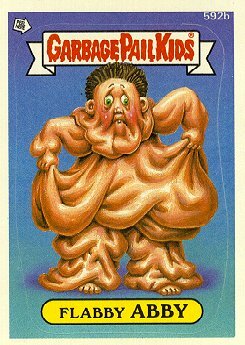 Most card dealers do not sell United States Garbage Pail Kids 15th Series sets with both the die-cut and non-die-cut cards. You will have to buy the two sets separately in order to piece together the variation set. 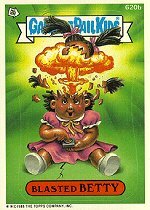 It was previously believed that the die-cut cards could only be found in the boxes that have packs with the 0-490-21-04-8 code (printed without 25¢), but collectors have found die-cut cards in the boxes that have packs with the 0-490-21-03-8 code (printed with 25¢). It does not appear that the pack codes or pack types make any difference in finding the die-cut or non-die-cut cards. Most likely, it is the date and time that the product was manufactured that made the difference, and you can only track that information by having the original case boxes that the wax boxes were taken from.